Brunswick Billiards is famous for their attention to detail and their high quality craftsmanship that puts their products at the top of the pool table food chain year after year. They apply the same standards of quality materials and expert construction to deliver air hockey tables that function like the pros without looking too childlike. Your game room deserves to look its best. 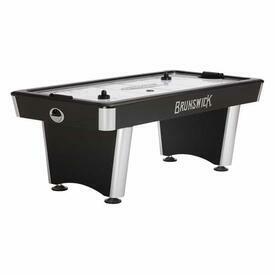 Find the best designed options from game table know-it-alls like Brunswick. The V-Force Hockey and the Wind Chill are both built in sleek black and feature a stylized super-slick playing field.